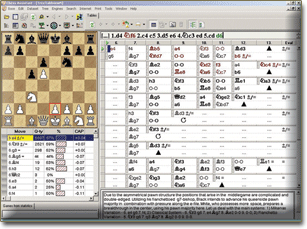 Chess Assistant 19 with Houdini 6 PRO is a unique tool for managing chess games and databases, playing chess through the Internet, analyzing games, or playing chess against the computer. 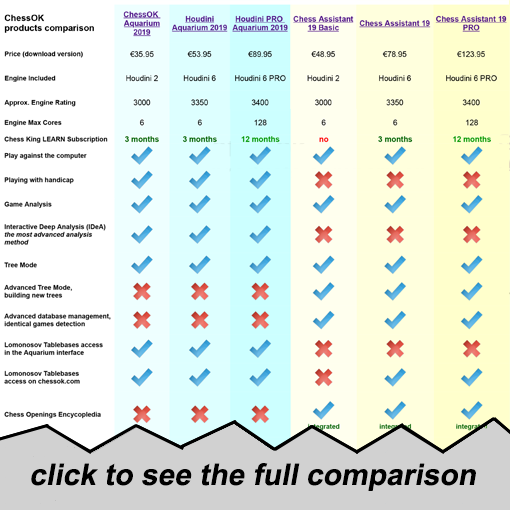 Chess Assistant 19 includes grandmaster level playing programs, Chess Opening Encyclopedia mode, a powerful search system, the unique Tree mode, databases of about 7.077 million games in total (Nov. 2, 2018) that can be automaticaly updated 3000 new games every week for free, 1-year access to all courses at Chess King Learn (How to activate Chess King Learn bonus subscription) and to 7-piece Lomonosov Tablebases at tb7.chessok.com and more! Houdini 6 PRO, the World's strongest chess program, continues the impressive surge made by its predecessor by adding another 50 to 60 Elo in strength, to become once again the strongest engine that money can buy. Houdini 6 PRO coming with Chess Assistant 19 PRO can support up to 128 cores and 128 GB of hash, including NUMA support! 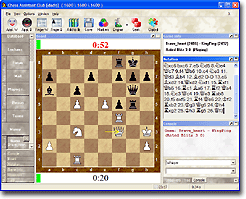 Chess Assistant 19 PRO is a unique tool for managing chess games and databases, playing chess online, analyzing games, or playing chess against the computer. 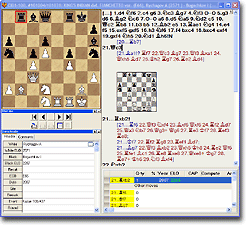 To get a better idea of Chess Assistant features you can watch short training videos. 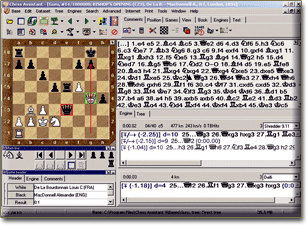 Chess Assistant 19 comes with the Houdini 6 PRO chess engine. 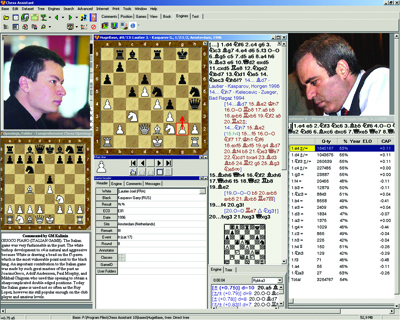 Houdini 6 leads most independent computer chess rating lists. No serious chess player can be without Houdini 6! Chess Opening Encyclopedia contains rich theoretical material on all openings. It contains over 8.000 annotations from GM Kalinin and 40 million evaluations by the strongest engines. The detailed key system for all openings can be edited to suit your needs. Search by position, header, maneuvers, material, comments, etc. Composite search allows you to store and organize your CQL queries into a hierachical structure, give them descriptive names, and set up a diagram of a typical position. This allows you to build a library of useful search criteria. Premium Game Service: subscription for full database updates with games played from November 2, 2018 till December 31, 2019, in Chess Assistant and PGN formats (supported by Fritz, Chess Base and Aquarium). Get full version of database without duplicate games. A database of chess games is a rather unwieldy collection of data. Of course you can sort the games, search etc. but all of this is temporary. The next time you open the database you will see the same list of games without any useful structure. If you want to repeat a search, you have to enter all the search criteria from scratch and then search again. Lomonosov Tablebases allow you to determine if any position with 7 or less pieces leads to a draw or can be won by either side - with 100% certainty. If the game can be won, the path with the least number of moves until the end of this variation is shown, given that both players make the best moves possible. If the losing player makes a suboptimal move, he will lose sooner and the program will show the new optimal path. Chess Assistant PRO 19 comes with 1-year access to all courses available at learn.chessking.com.